Biosensors in Clinical Trials - Vaxa Inc. 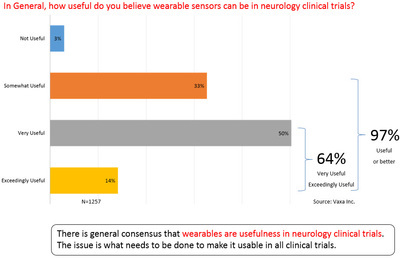 There is almost universal agreement that wearables or biosensors can be of great value in clinical research in drug development. 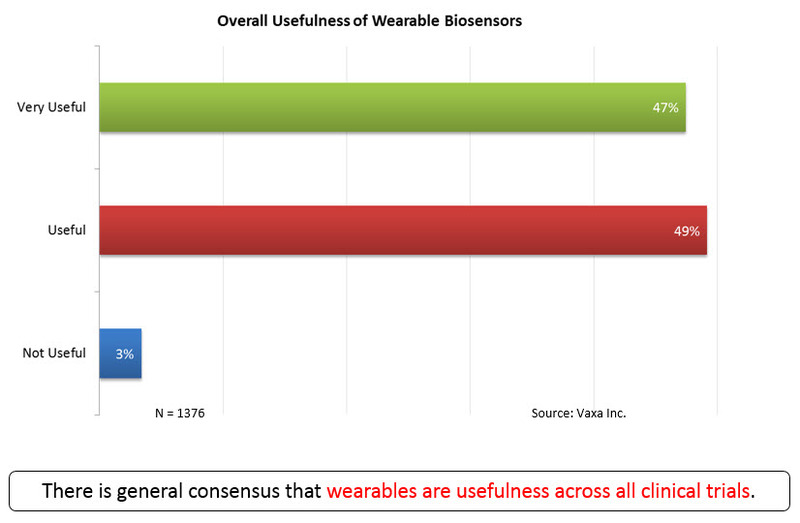 In survey after survey (see charts below) in the clinical trials industry, Vaxa has found that over 95% of Principal Investigators and their teams agree that biosensors are either very or exceedingly useful. Additionally, in Vaxa’s research with senior clinical research executives, no one disagrees that the potential of biosensors in clinical research is tremendous. So, why if biosensors can have such a seismic effect on clinical trials, isn’t it being used to a meaningful level in any live drug trials – that is, where the data collected from biosensors are part of an integrated dataset used to demonstrate a drug’s safety and efficacy to a regulatory body? There are no “fit-for-use” wearable or biosensor solutions on the market today for clinical research. This is as true for the major consumer brands as for companies who position themselves as niche players. The industry does not yet understand the real business value biosensors can create for clinical trials. That is, the relationship between specific therapeutics and the biosensor measurements and how that can contribute to an order of magnitude more insights into a drug’s safety and effectiveness. Regulatory bodies have not provided guidance regarding data usage from biosensors in demonstrating drug safety and effectiveness. The regulatory bodies are waiting for industry to make the first move, and, industry is waiting for the regulators to provide guidance before making any notable investments. This is not the only catch-22 creating inertia in the system. The other catch-22 is that the industry expects biosensor companies to create a ready-for-use solution and hand it to them, but, the industry has not articulated its needs since it hasn’t taken the time to do so. Lastly, the industry is looking for the ideal single solution when, in fact, it will never exist, given the complexities and variabilities of diseases. There are options to creating a strategic platform that is adaptable to different diseases, therapeutics, endpoints, and outcomes. We believe that unless the pharmaceutical industry starts thinking very differently about biosensors in clinical research, they will continue losing a major opportunity to reduce drugs time to market, cost, and increasing sales through higher reimbursements.